After months of discussions with officials both in Brooklyn and Los Angeles throughout the summer of 1957, O’Malley finally chose his course of action. On Oct. 7, 1957, the Los Angeles City Council voted 10-4 to agree to enter into a contract with the Dodgers. The next day, the Dodgers announced they were indeed moving to Los Angeles for the 1958 season. In a period of change, especially for the players and front office staff, Vero Beach was the one constant, a place called “home” for two months of spring training that had a familiar and special feel to it. Dodgertown employees who remained through the years became friends of the ballplayers, staff and front office, unifying each camp. 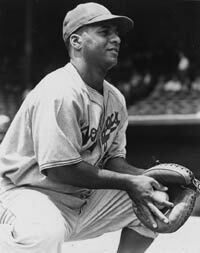 It was three-time National League MVP Roy Campanella captivating players and staff, who sat in a semi-circle, with his stories, anecdotes and instruction in an area outside the camp clubhouse which permanently became known as “Campy’s Bullpen.” It was poker games by the sportswriters and team executives, including O’Malley, late into the night. It was wives gathering poolside to chat, tan and relax in the hot Florida sun. It was photographers Herbie Scharfman and Barney Stein doing their professional magic and recording for history the activities of each camp. It was Manager Alston slamming his 1955 World Series ring against Larry Sherry’s door and cracking the diamond-studded stones in anger over the noise made by pitchers Sherry and Sandy Koufax returning to base after curfew. It was Nurse Anatasia Plucker dispensing her “salt solution” in paper cups to players suffering from heat exhaustion.Pascal James Imperato, M.D., “Himself, Mrs. Plucker, and the rites of spring, New York State Journal of Medicine, February 1989, Page 87 It was Charlie Ehrmann running the Dodgertown canteen, while his wife “Archie” worked in the business office. It was a local welcoming committee and thousands of fans at the Vero airport when the Dodger plane arrived to break the seal on another spring season. While O’Malley had his hands full with the business matters in Los Angeles, especially his efforts to initially find a place to play and then finally build his dream stadium there, Dodgertown continued to thrive. In 1957, Piper Aircraft Company arrived in Vero Beach set up its “research and development center on the grounds of the former Naval air station.”Sidney P. Johnston, “A History of Indian River County”, Page 118 The additional industry and population would also help the area’s beginning as a resort town. 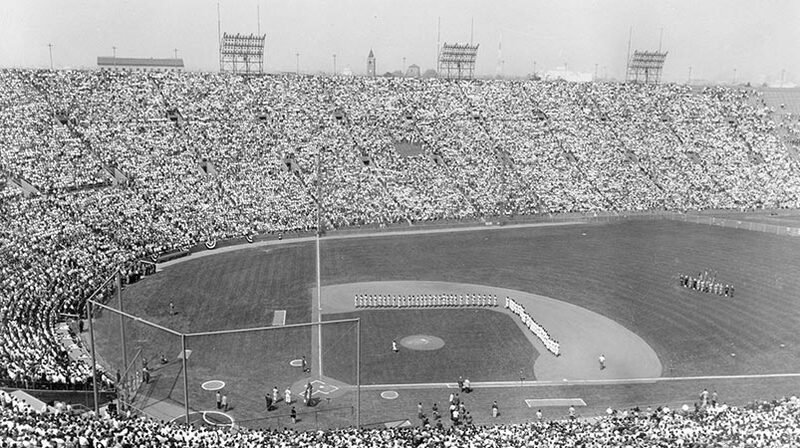 O’Malley completed Dodger Stadium, his 56,000-seat showplace in Los Angeles, in 1962. It was the first privately-financed stadium since Yankee Stadium opened in 1923. 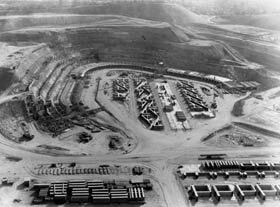 The topography of the Chavez Ravine area was so hilly, that construction teams had to move some eight million cubic yards of earth. 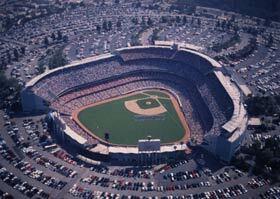 But, both Holman Stadium and Dodger Stadium were designed similarly by Capt. Praeger and O’Malley, as they literally took the dirt and pushed the ground up to form the sides of the bowl. Both stadiums have unparalleled sightlines and fans are close to the action. And, they both have colorful landscaping that adds to the ballpark’s natural beauty. Roy Campanella abilities as a batter and catcher are well-chronicled, but the three-time National League MVP also has a special corner at Dodgertown known as “Campy’s Bullpen” where he shared stories with players and staff. 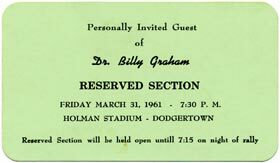 Evangelist Dr. Billy Graham speaks to a large gathering during his Florida Crusades at Holman Stadium on March 31, 1961.